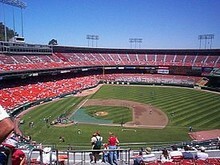 Candlestick Park (colloquially, The 'Stick) was an outdoor sports and entertainment arena; home to the San Francisco 49ers in the NFL and San Francisco Giants in MLB. 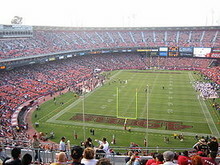 The stadium was home to many memorable moments in sports; notably the Montana led 49ers when they were at the height of the NFL and the 1989 World Series between the Oakland A's and San Francisco Giants when a 7.1 earthquake hit the Bay Area. During the dot-com craze of the late 1990s the rights to the arena name were licensed to 3Com Corporation, and from 1995 until 2002 the park became known as 3Com Park. Later the naming rights switched again to Monster Cable. Here's a look at what the history of the Candlestick Point area from SF Curbed.